Tomorrow is Saint Patrick’s Day, a holiday that offers plenty of excuses for drinking, but few prospects for straying from the well-worn celebratory routines. For most, it’s a day for swilling cream-and-whisky liqueurs, Irish stouts, and – less credibly – emerald-tinted American macro-lagers. 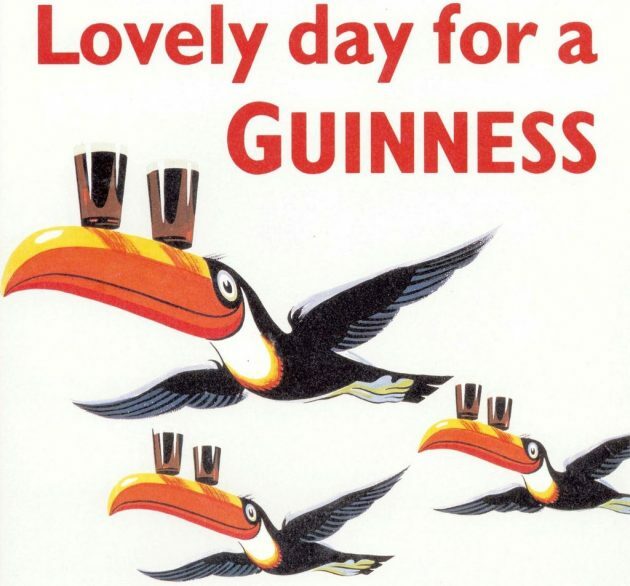 And while the brewery at St. James’s Gate in Dublin has featured toucans in its colorful vintage advertisements, you don’t need me to remind you to drink Guinness on Saint Patrick’s Day – especially when the world’s most iconic Irish beer occasionally replaces its Trinity College harp logo with a large-billed Neotropical bird best known in cartoon form. Three members of the family Ramphastidae: a versatile mascot for everything from Irish dry stout to fruit-flavored breakfast cereals. So, in the spirit (pun intended) of avoiding the predictable, all the while keeping things Irish and saintly and alcoholic and ornithological here on this Saint Patrick’s Day edition of Birds and Booze (a tall order! ), I happened on a whiskey that commemorates a slightly later and lesser-known Hibernian monk who’s got something Paddy certainly does not – a hagiography with a good bird miracle. Sacrilege perhaps, but unless we’re talking invasive species, snake extirpation doesn’t cut it here at 10,000 Birds. Sorry, Patrick. 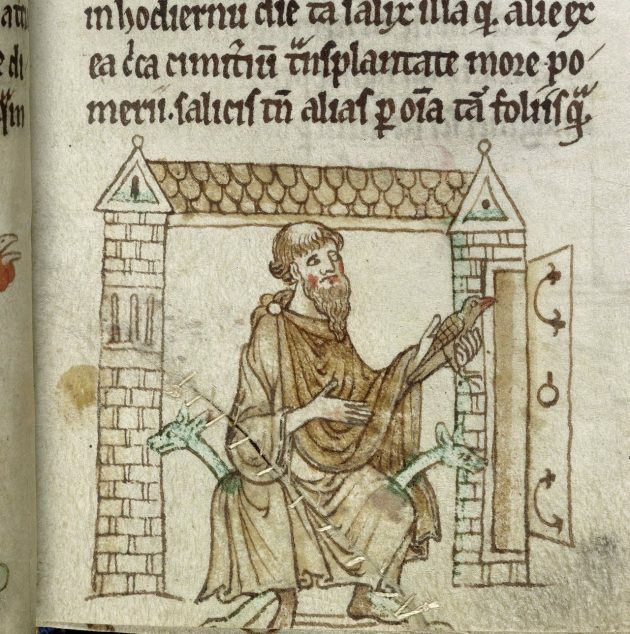 Saint Kevin of Glendalough was a very long-lived saint (498-618!) who founded a monastery in the sixth century in County Wicklow, in a glen between two lakes for which the now-ruined abbey was named. True, he isn’t as celebrated as Patrick these days, but whatever the veneration of his cult might lack in rivers of green-dyed vomit and “plastic Paddy” kitsch, Kevin more than makes up for on account of his miraculous and saintly concern for birds. According to one legend, Kevin was kneeling in prayer one day when a blackbird alighted on his outstretched hand and began to build a nest. Not wishing to disturb the bird, Kevin resigned to hold his reverent stance until the eggs she laid hatched and the young blackbirds fledged, which he did with stoic perseverance for weeks. What’s the eBird breeding code for that? Saint Kevin and the blackbirds. Manuscript illumination from a 13th-century English edition of the Topographia Hiberniae of Giraldus Cambrensis (Gerald of Wales), written around 1188. British Library MS Royal 13 B VIII. So why a blackbird? It’s unclear why the Kevin legend so clearly specifies the type of bird – and here, I think we can assume it was a Common Blackbird (Turdus merula). It seems that it could have been any passerine without altering the story much – just as long as it was a nest-builder. (Had a cavity-nester had landed on Kevin, he would have been in for some pretty serious stigmata, and – I hope – even greater fame as a saint as a reward for those wounds.) Perhaps the mention of a species gives the story a veracity that “bird sp.” just doesn’t provide. Whatever the case, because of his effort, Kevin became and remains the patron saint of blackbirds (seriously). I’m no expert in theology, but I pray his benevolent patronage extends not only to the Turdus blackbirds of Eurasia, but North American icterids as well. Considering the Emerald Isle’s vaunted literary traditions, it’s not surprising that the obscure blackbird legend of Saint Kevin has inspired a wonderful little poem by Irish Nobel laureate Seamus Heaney, in addition to forming the subject of several paintings by Welsh artist Clive Hicks-Jenkins. The story also caught the attention of the Glendalough Distillery, makers of this week’s featured whisky: their logo pays homage to Glendalough’s holiest resident, with a silhouetted image of Saint Kevin and the mother blackbird perched on his open hand. 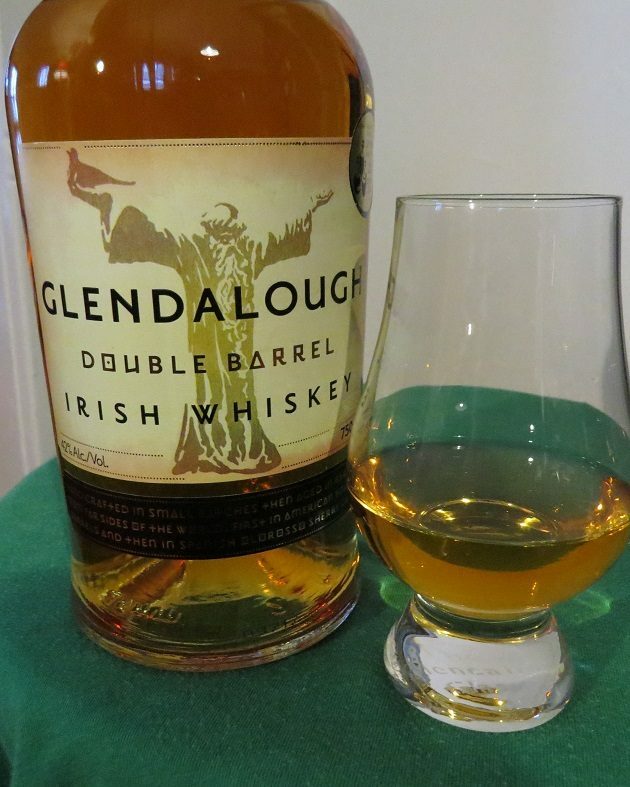 Glendalough was founded in 2011 as an ambitious whiskey aging and blending operation, for which they initially sourced spirits from the Cooley Distillery in County Louth, but opened their own distillery in 2013. They make a range of distilled products, including an Ur-whisky of sorts, an ancient moonshine known as poitín in Irish Gaelic. Their Double Barrel Irish Whiskey is made with a less revivalist intent, but remains an inspired departure from conventional mass-market Irish whiskies: an Irish barley malt and corn whiskey aged in American bourbon barrels for three and a half years, followed by a further six months finishing in Spanish Oloroso sherry casks. 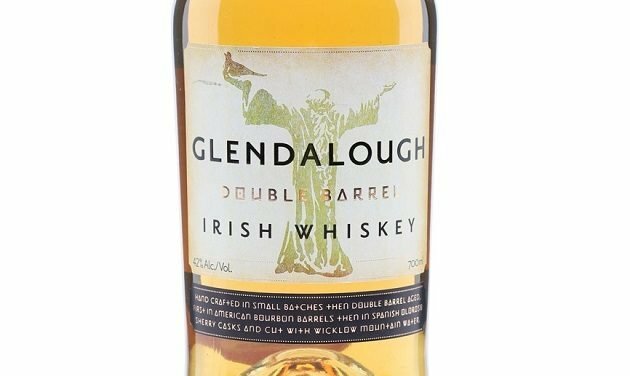 Glendalough’s Double Barrel Irish Whiskey is a luminously clear and pale amber, with a good deal of color for such a young spirit. An initial aroma of nutmeg turns to bright bubblegum and even citrus upon deeper inhalation, while the underlying aroma invokes the sweetness of vanilla, brandied cherries, dried fruits, and sticky toffee pudding, with a strong oak fragrance throughout. The creamy palate is spicy to start, with hints of cinnamon, before settling into butterscotch, more dry wood, and even a suggestion of vanilla ice cream. There’s a nutty hint of marzipan in the light but warm and spicy finish, rounding out this complex Irish whiskey nicely. Any one of Glendalough’s fine whiskies would make a fittingly Irish drink for Saint Patrick’s Day tomorrow, or Saint Kevin’s Day on June 3rd – or any other day of the year for that matter, Irish holiday or not. But whenever you partake, be sure to spare a thought for the kindly Saint Kevin and the blackbird. Good birding and sláinte mhaith! 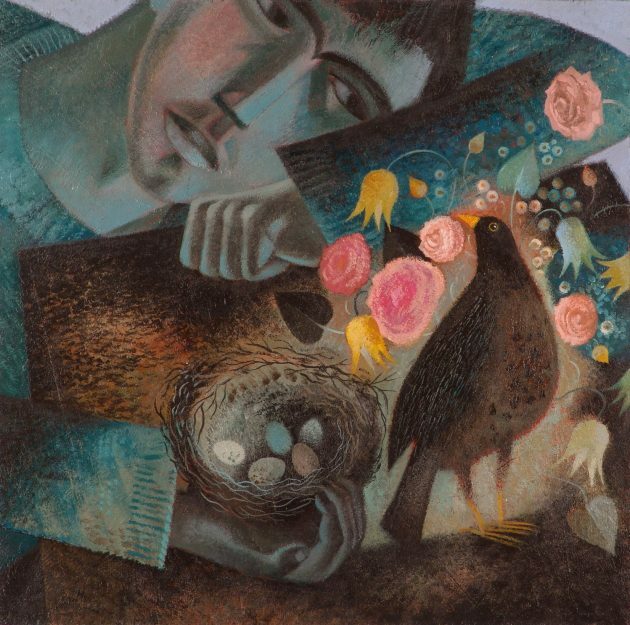 The Saint Kevin blackbird legend, as depicted by Welsh artist Clive Hicks-Jenkins.